Ed and his wife Susan have a long history with the EyeCare WeCare Foundation. They were first involved with the annual EyeCare WeCare fundraising golf tournaments in Jacksonville, Florida. Ed and Susan sponsored the Foundation's very first trip to the Luzon in May of 2010 in Macabebe, province of Pampanga. They sponsored their second mission in May of 2012 in Cabuyao and Binan in the Province of Laguna. They have found a new home for the Mobile Vision Clinic in close proximity to their residence and they are in charge of it as well as the eye testing instruments and eyeglasses. They coordinate all the missions in the Philippines, choose the venues and choose the sponsors. Susan was born in Pampanga, Philippines and migrated to the United States in 1961. Her father was in the United States Navy and her mother was a school teacher. She returned to the Philippines and earned a Bachelor of Science in Medical Technology from Centro Escolar University. She then returned to the United States where she met and married husband Ed Damilao. She worked at Kent County Hospital, RI as a Med Tech for 10 yrs. Susan also has 10 years of management as a multi store manager with Sunglass Hut International. Susan retired as an Optician from Jacksonville Eye Center after 15 yrs and is currently residing in the Philippines. In 2011 she started the Sammy & Dionicia Bautista Saup Program which is a scholarship for indigent students of San Jose and San Rafael, Macabebe, Pampanga. The program to date has 21 high school scholars and 2 college scholars. The program also has a yearly Game Day event, school feedings, and seniors food distribution. The SAUP Program has partnered with ECWC Foundation and the students will be volunteering to prepare the recycled used eyeglasses for upcoming medical vision mission. They will be reading prescriptions from the eyeglasses, recording the power on a plastic bag, catagorize them by Men, Women or Children and sort them in order of successive powers. This will fulfill their community service requirement for school and may lead to medical careers in the future. ​Philippine Branch Office has moved to Manila! 2015 has seen a lot of improvements to a well established, well known Foundation in the Philippines that has been bringing free vision services to the poor people there for many years. 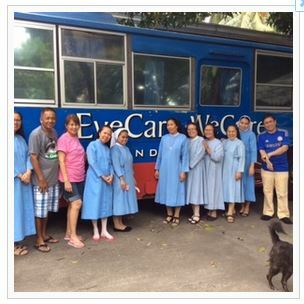 The Mobile Vision Clinic and the EyeCare WeCare Foundation branch office, has been located on Negros Island for the last 10 years. The last 5 years, every mission has been conducted in the Luzon, a 24 hour ferry boat ride for the Mobile Vision Clinic and it volunteers. This added expenses of $5,000 to $6,000 for every mission. just for transportation. Moving the operation to Luzon will save time, wear and tear, and money that can be better spent in services than on transportation. 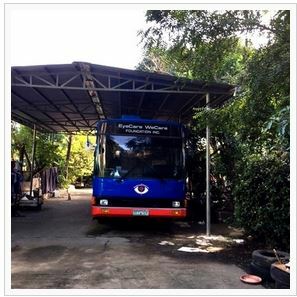 The mobile clinic is now in Makati at the “Missionaries for the Child Jesus” church grounds and they are letting the foundation store the mobile clinic there until a permanent home has be determined. Now that the Mobile clinic has been moved to its new branch office, the bus has now been completely restored and a new bus garage has been constructed on the grounds at The Missionaries of the Child Jesus.